Today, Mark Zuckerberg took the stage at a converted warehouse in SOMA to address the world about something we are all much too familiar with, Facebook. 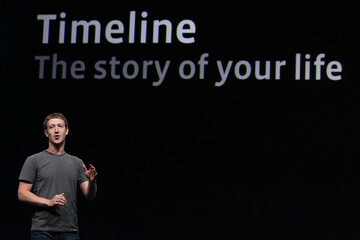 Zuckerberg’s overall message was: Discover through friends. The keynote address started on an up note with Andy Samberg (a personal favorite) posing as Zuckerberg. Zuckerberg then took the stage and fumbled through his presentation with the repeated statement “this is really exciting.” So maybe he’s not the best presenter, but there is no doubt in the ability of Facebook to change how we communicate. See a full archive of everything you have done in your entire life from birth until now organized by year. Facebook is now your go-to place for images, social check-ins, app usage, games, updates, etc. Search back in time for memories and key turning points in your life. Scroll back to the top and welcome to present day. If people weren’t afraid of the internet knowing all before, run for your lives. Ok, so maybe I was a bit harsh. Yes, the new Facebook announcements encourage us to spend more time on Facebook, but in all, they also allow us to discover new interests, likes, wants, etc. with our friends. I’m sure we will all benefit from the new news, movies, music, games and restaurants we discover from our Facebook friends. Of course all Facebook users are freaking out about yet another change, but they will get used to it. Hopefully this change really will bring us one more step toward using social media to connect outside of the internet.